Better late than never. Memories fade and time erodes all things. This past weekend I cruised around Los Angeles, looking for places that once played a part in my family's history, cramming into a long weekend what I could have done when I lived in LA some years before. Homes aren't necessarily relevant when doing ancestral research - neighborhoods change and buildings get demolished. However when you get a sense of where your ancestors lived, it gives life to the cold facts that are scrawled on the census rolls. With a little imagination, you can put yourself in your predecessors' world, to picture what their lives might have been like, to see things that might not be evident on a piece of paper. What did this place look like back then? Who were their neighbors? Los Angeles plays a significant part in to immediate branches of my family tree. First of all, as I have always known, my maternal grandmother ("BLF-B") grew up in and is buried in LA. Some years back, my mother and I visited her grave, as well as the house that BLF's step-father built in Burbank ("1160"). We stopped by, met the home's current owner (who bought it from my great-grandparents) and also the young couple who was buying the house. It was a great nostalgia trip for my mom. Unfortunately, the roll of film was bad and we had no record of our tour. Years later, I returned, having lived nearby and done nothing about it. As before, I knocked on the door of 1160 and began chatting with the Mrs of the house, showing her a photo of my mom and her parents in front of the house circa 1958. Within minutes, I was getting a full exterior tour of the house, learning what was added on by past owners, and re-taking the photos we lost thirteen years before. I was happy to see that the avocado trees my (step) great-grandfather planted back in the 40s were bearing more fruit than ever before. I left with a bag full of fruit. 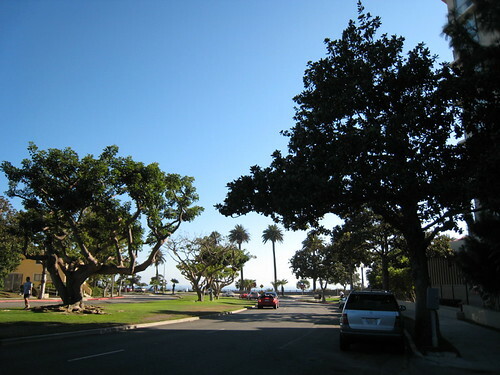 On the other end of town, in Santa Monica, I found the oceanside street where my paternal grandmother ("BCB-V") spent her teenage years. Practically (orphaned other than her younger siblings and a step mother), she came from the wilds of Montana to this sun-soaked setting, where several buildings of the era (1930s) still stood along the tree-lined boulevard, but not the one where she lived. It was enough to get a sense of the place during an unpleasant time in her life. With this I still swear that it's better to visit a place than just to read about it.